This time last year, in January 2015, I made a rare exception to my usual rule [which is that my New Year’s Resolution is not to make any resolutions] and set myself the challenge of creating a wildlife section in our garden within the year. I was allowed to take over an overgrown bed by the proper gardener so that she could spend more time on other areas. In this blog post I will work through some of the issues that will confront the average gardener and the solutions that I came up with. In a separate blog I will be running a diary of how the plants and wildlife fare in 2016. These are the questions which I have tried to answer; click on them to jump to that section or just read the whole article. Why make a wildlife garden? Will it detract from the rest of the garden? How long will it take to make? There are so many suggestions. How do I decide what to plant? Okay, so what did you actually do with your garden? 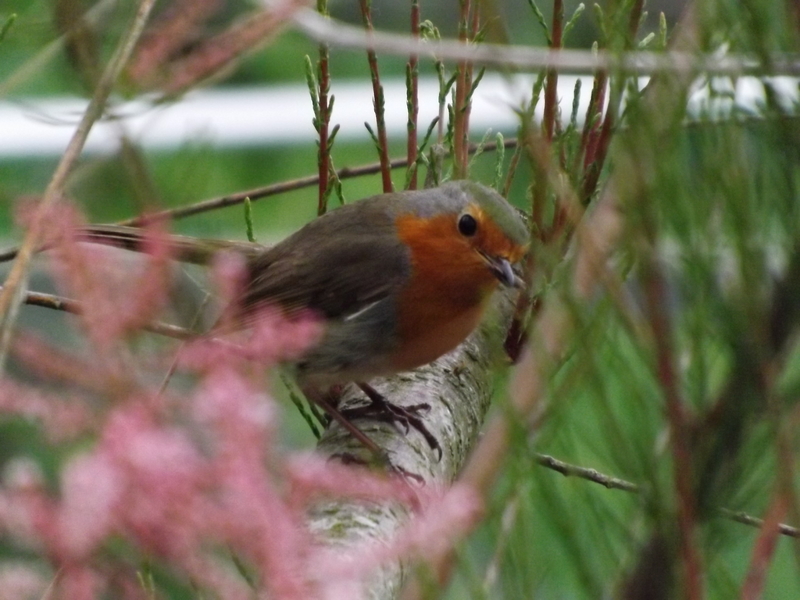 a resident robin overseeing my work! We are very lucky to have about a quarter of an acre with a wide variety of shrubs and plants which attract an enviable range of wildlife. 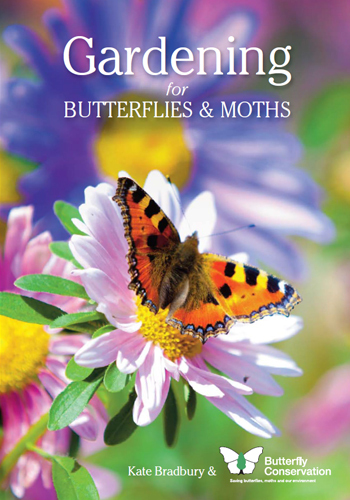 In the past few years I have recorded over twenty species of butterfly, various hawkmoths and dragonflies, several species of bumblebee and a wide range of birds including cuckoo and firecrest. However, I wanted to follow the advice and encouragement of bodies such as the RHS, Bumblebee Conservation Trust and Butterfly Conservation, as well as individuals like Dave Goulson and Kate Bradbury that even in a garden such as ours, a dedicated area for pollinators will still make a difference. I found this little book very useful as it fitted into my bag and was regularly referred to in nurseries, but there are other similarly helpful resources available. There is a general perception that ‘wildlife’ means ‘weedy’. We have corners of the garden that we can leave scruffy with nettles and the like so the intention was very much to plant a bed that was as attractive to the human eye as to the insects. I hope that I can show it is possible to combine an appealing selection of all year round colour that is also very good for pollinators. This will obviously depend on the area set aside but the most important and time consuming part is collecting the plants. You should expect this to take most of the year as I will explain. Beyond that, it is no different to planting up a normal bed, for that it what it is. My best advice here is to let the insects tell you. You will already have plants in your garden that you know are popular so take cuttings, split plants or move them. When you are at garden centres, plant fairs or visiting other gardens, large or small, look for the ones with all the insects visiting them. Like all keen gardeners we have places we regularly visit to buy plants. Equally, we need little prompting to pop into a new nursery for a rummage if we come across one when supposedly going somewhere else and will always make time to visit places with nice gardens when on holiday. All I have done is included one or two for the wildlife garden each time. 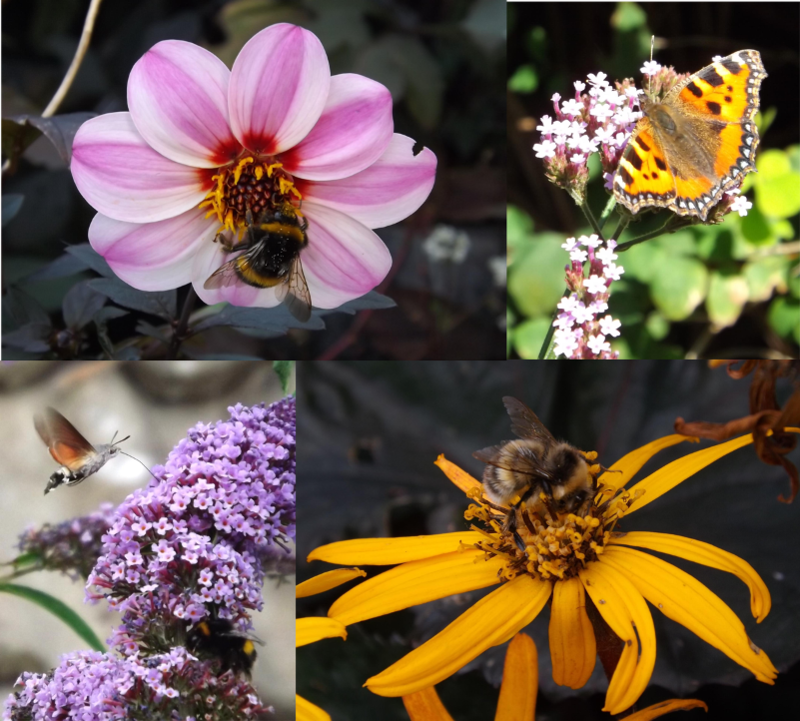 By collecting plants in flower throughout the year, I know that the bed must then provide colour and nectar all year. It is worth being a little careful when choosing. You will notice a wide variety in popularity even amongst different strains of the same plant. Also, do be aware of regional variations when buying plants away from home. We have all bought beautiful looking plants that thrive elsewhere but for whatever reason, simply wither and die in the prevailing conditions in your own garden. The same is also true with regard to their attractiveness to pollinators. You may be choosing a plant that is very popular with a species of hoverfly or bee that doesn’t live in your area. 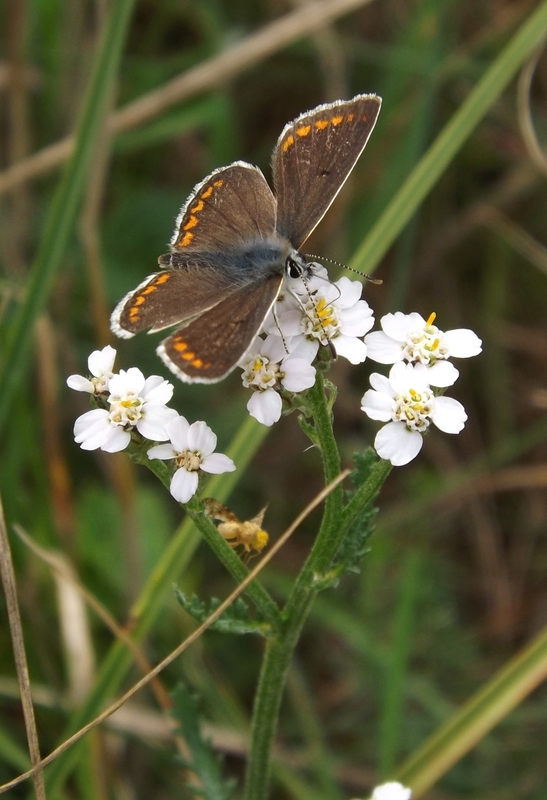 Also, some insects change their preferences as you move about; for example Brown Argus butterflies like common rock rose on the grasslands of southern England but move further north and they prefer wild geraniums. Generally, I have tried to buy standard items when further afield and have chosen less well known plants by eye from more local sources. 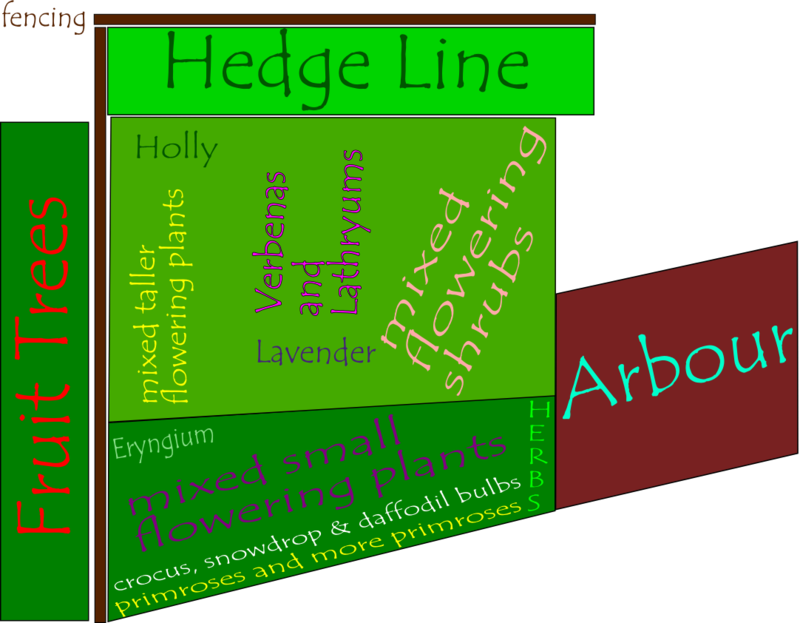 As you can see from the plan I created two main areas: a section with bulbs, herbs and smaller flowering plants which are allowed/encouraged to self-seed in front of a larger area of small shrubs and taller flowers which are planted through a weed suppressing membrane for ease of management. 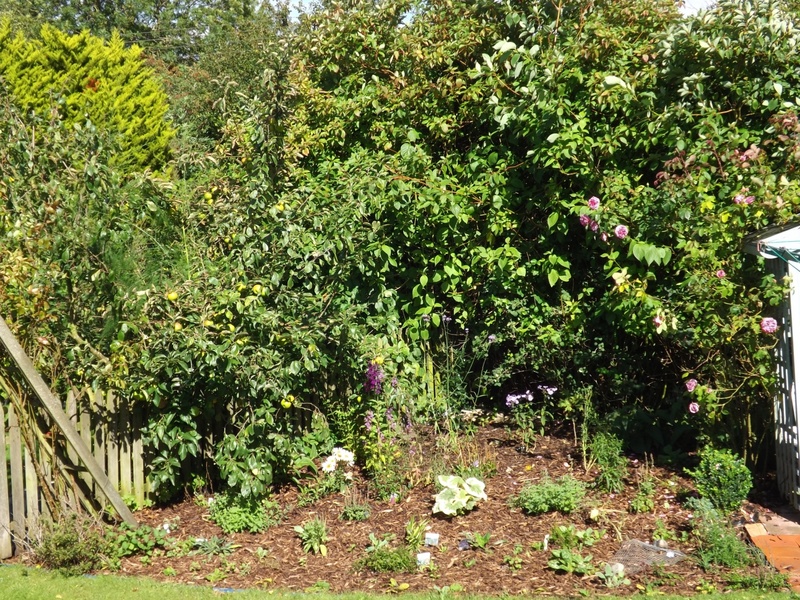 At the back is the existing hedge line with honeysuckle, wild rose and cornuses which are all perfect for the backdrop to a wildlife bed anyway. To the left are fruit trees which again are excellent for pollinators. To the right beyond the arbour is my ‘black’ bed which has ligularias, dahlias and sedums which are very popular with the local bumblebees who often nest around this part of the garden. As with any newly planted area, some plants will thrive, others not so. By writing a weekly diary I should be able to spot problem plants and replace them through the year so by next January the bed should be much more established and settled. I am sure that I will keep adding to it though! 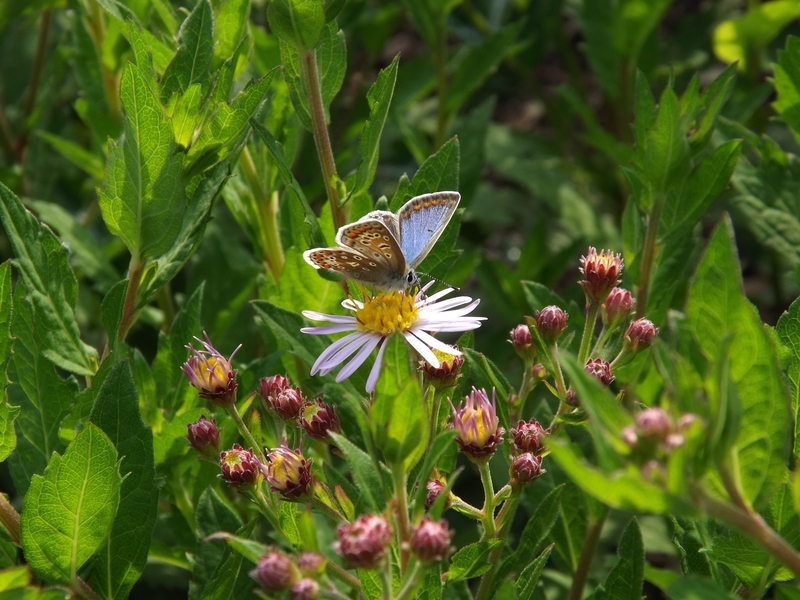 This entry was posted in Wildlife and tagged bee, butterfly, garden, plants, pollinator, wildlife. Bookmark the permalink.